ibVPN Review 2019 - Is It a Relatively Slow VPN in Comparison to Competitors? IbVPN was billed as a proxy service provider back in 2003, but an encrypted VPN service was launched by the developer company, Amplusnet SRL, in 2010. It’s one of the cheapest VPNs I tested out. Nothing fancy, but the VPN indeed delivers on its promises, which is why I decided to delve into the features and functionalities of this Romania-based VPN. I have conducted myriad tests to figure out how it measures up against the competition. Its server pool is relatively small, and while it offers pretty basic features, it will surely help you in surfing the web anonymously. Here’s a detailed overview of ibVPN, which has already got more than 500,000 satisfied customers worldwide. ibVPN, a low-cost Romania-based VPN, will hide your IP and teleport you to some other location as per your preference. With a strong AES-256 encryption, it is capable of safely tunnelling your internet traffic with its OpenVPN protocol. Whether you are looking to do online banking or torrenting, or you simply want to browse the web while not letting your ISP know your real location, this VPN can help you go completely anonymous. If you use hotel or coffee shop Wi-Fi hotspots frequently or torrenting is banned in your country, ibVPN can be a good choice for you. The low-cost VPN indeed offers some great features which are not offered by some of the big names in the VPN industry. For example, most of their servers unblock Netflix, you can download media files from torrent servers using ibVPN, and supports a wide variety of devices (and TOR as well). The VPN application comes with a kill switch, which can ensure your anonymity even if your internet connection is turned off out of the blue. While slow speed on some servers might be a concern for some of the users who value performance more than security and anonymity, the affordable VPN will stay ahead of the curve due to its impressive security features and the super-customized packages for different types of users. Amplusnet developers have also nicely blended in a Smart DNS and have optimized the servers for avid gamers and torrenters. 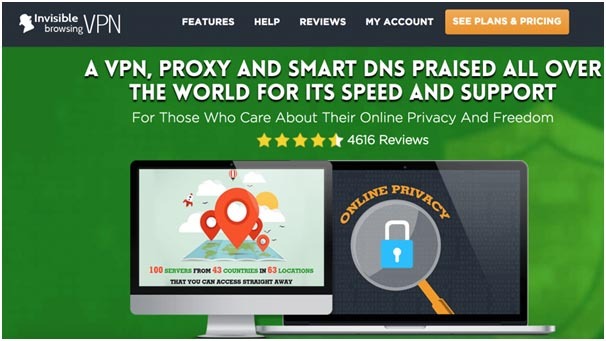 Overall, it’s a reliable VPN which you can buy for a good price. In case you are not ready to shell out money at this point, you can even opt for a free trial, which would give you full access to all of their features for 24 hours. “ibVPN does not collect or log any traffic or use of its Virtual Private Network service. IbVPN is an ever-evolving VPN, with the developers regularly adding new features to make it more comprehensive in nature. The developers added TOR support only last year, and if you pair ibVPN with TOR, the TOR browser will channel your traffic through various proxy exit nodes. It’s not fail-safe, as you would still be using the TOR IP, and not the ibVPN one. This is one big loophole which can possibly de-anonymize you in the middle of browsing session. Fortunately, ibVPN has some TOR-enabled servers, which you can use for complete anonymity (one of their support execs recommended me three servers for pairing the VPN with TOR, and these are Netherlands – tornl.ibvpn.com, Singapore – torsg.ibvpn.com and US – torus.ibvpn.com). However, there’s still a catch. You need to upgrade to the Ultimate package to attain full anonymity while using TOR with VPN. Torrents are a great option when it comes to downloading big files at good speeds. However, torrenting is not 100% secure and if you want to secure your system while torrenting, adding an extra layer of protection is highly recommended. One big advantage of ibVPN is that they allow torrenting, but you need their Ultimate VPN package for torrenting. If you subscribe to the right plan, you can preset your desktop client so you connect to their torrent servers every time you launch the application. Torrenting is not allowed on all of their servers and you need to use their P2P servers for torrent downloading. At present, 35 ibVPN servers allow torrenting and these are servers are located in NL, CA, LU, CH, BG, HK, SE, LT, LV, UA and RU. You can find the servers at the bottom of their list of servers. Hint: The servers that allow torrenting have “p2p” in their name. Can You Access Netflix with ibVPN? Switching to a different server location through a VPN service is the most convenient way to access top streaming websites like Netflix. This way, you can easily bypass geo-restrictions and access any content on Netflix. I tested out ibVPN New York and Miami servers and both of the servers worked. However, their Canada, Chicago and Netherlands servers failed at it. 40% of the ibVPN servers worked when I tried to connect to Netflix, which is not bad at all given the fact that Netflix simply loves to block VPNs. China’s infamous Great Firewall blocks pretty much everything and it’s really difficult to find a VPN which actually works in China. Fortunately, ibVPN is still among the thin minority of VPN services that allow no-frills browsing in China. The company has invested in a new technology called ‘Shadowsocks’, which focuses more on proxying than anything else. ‘Shadowsocks’ is a free SockS5 proxy which was developed by a Chinese programmer. It creates an encrypted connection between the device you are using and a proxy server using SockS5, and is almost impossible to be detected. The sad part is that the Shadowsocks VPN only works with the Windows client. Nevertheless, it’s super-simple to set up and you can easily bypass the ‘Great Firewall of China’ if you are using ibVPN for Windows. How Popular is ibVPN Online? Google Trends is an excellent tool for analysing search trends for any specific product, keyword, topic or person and is widely used by search marketers. I decided to take a look at the recent and past search trends for the keyword ‘ibvpn’, which is a pretty common and generic search term. However, I noticed that the general interest among US-based internet users around the specific search term has only dwindled over time, perhaps because many faster VPNs have already flooded the market. However, internet users seem to be moderately interested in reading ‘ibvpn review’ (the search term I used), but very few people are seemingly interested in buying the VPN, at least going by the search trends (I searched with the term ‘buy ibvpn’ and it returned with no results). What About Social Networking Websites? Like all good VPNs, ibVPN also allows you to access social media websites, and the most popular ones like Facebook, Twitter and Instagram without a hitch, irrespective of where you are located. They have a relatively small but effective selection of servers, and you can easily access blocked content using any of their servers. Even if you are in China or Estonia, you shouldn’t be facing issue while trying to access any of the popular social media sites. Bot, an ibVPN support executive, maintained during a live chat session with me and told that they do not limit speeds in any way on their servers and the speed is mostly dependent on a variety of factors. While this is true, I decided to test out the VPN to figure out how fast it is actually and I must say that ibVPN fell short of my expectations. While it’s important that you use a secure VPN, you wouldn’t want to sacrifice speed for security, would you? While it’s acceptable and pretty natural that a VPN would slow you down to a certain extent, ibVPN was one of the slowest VPNs I tested out. While their EU server speed was okayish, their US server speed was sort of a nightmare, or maybe worse than that. 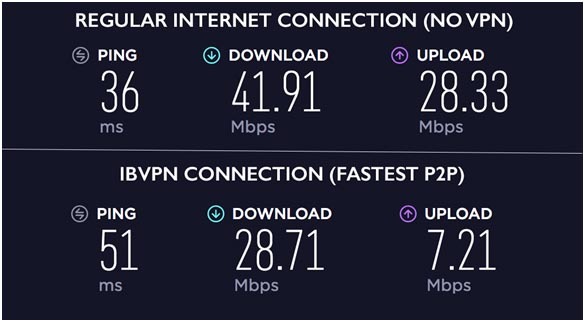 Download speed was 15.7 Mbps on their New York server, which is a little less than 90% slower than our 97 Mbps benchmark, and upload speed was only 13.44 Mbps, which is again 75% slower than our benchmark. Overall, it’s a relatively slow VPN. When it comes to a speed I can select TorGuard, ExpressVPN and HideMyAss based on users observations and my own tests. Coming back to the sunny side of things, ibVPN is extremely simple to set up, and connecting to one of their servers through the desktop client was also a breeze. I was able to install the application in less than five minutes, although it depends mostly on your internet connection’s speed, and the application was fired up within seconds. Also, the VPN allows you to set your personalized settings and forget it. For instance, if you set the kill switch in auto-activation mode, you don’t have to worry about connection drops anymore. You can also opt for advanced customization and have your personalized settings. You can connect to the fastest server, set the default server, and find and connect to P2P servers almost effortlessly. The desktop application blends two screens into one. On the left side, you can find the main dashboard, along with all the customization options, and on the right side, you can find the list of servers, which makes it particularly easy for even a beginner to navigate through the customization options and the servers. ibVPN is committed to offering outstanding customer support. The ‘Help’ section of their website contains an impressively large array of setup guides, frequently asked questions (along with answers) and a vast knowledge base. If you cannot find answer to a specific query, you can visit the support forum where you can interact with other members of the ibVPN community, discuss various issues and get various troubleshooting hacks. If you want to talk to a customer support executive, you have a plethora of options. You can either raise a support ticket, or send them an email or chat with one of their live chat support executives without further ado. Their support executives are all thoroughly knowledgeable and you can expect prompt replies from them. However, you should take a note that the company has outsourced their live chat support to Zendesk, therefore, you should stick to submitting a ticket in case you put privacy on your priority list. The Ultimate VPN Package comes with all the basic and premium features and you can access all of their servers if you opt for this package. The pricing starts at $10.95/month, but if you go for the full one-year plan, you can snag big savings as the monthly price drops down to only $4.83 in that case. The company also offers individual packages, including a Torrent VPN, a Premium Standard VPN, two Small Business VPN plans (VPN+Smart DNS), one Family Plan and one IBDNS /SMARTDNS plan. The lowest you can pay is $3.08/month. The business plans, as you can assume, are great for teams that need to connect more than a few devices. Each of the packages comes with a fifteen day money back guarantee. They accept nearly all forms of payment, including Cryptocurrency, but surprisingly, PayPal is still left out from the list of options. There’s also a 24-hour free trial available. All in all, ibVPN has a lot of features which any privacy-conscious user would totally love. It has a relatively small server pool, but the total number of servers is not too small either. Their no-logging policy is as good as it sounds, they have servers for torrenting and Netflix, and you can configure the VPN to use it with TOR and DD-WRT routers. However, the speed of the VPN is not at par with the fastest VPNs such as IPVanish or Private Internet Access VPN. Another major drawback of the VPN is that you have to go for the Ultimate VPN Package to avail all of their premium features.